A purchase, rather than a sale, changed Sotheby’s fortunes in the mid-20th century. In 1964 the company bought Parke-Bernet, America’s largest auction house. Founded in 1885, it had become a favourite destination for Manhattan’s high society and collectors. In acquiring the firm Sotheby’s became the first international auction house. The company already had a foothold in New York. For some time, Sotheby’s had sourced works in the US to sell in London, a strategy strengthened by the network of connections built by its chairman Peter Wilson during his wartime service in America. In New York, Wilson noted, you could find Impressionist paintings bought by Americans during the 1920s that had become priceless. 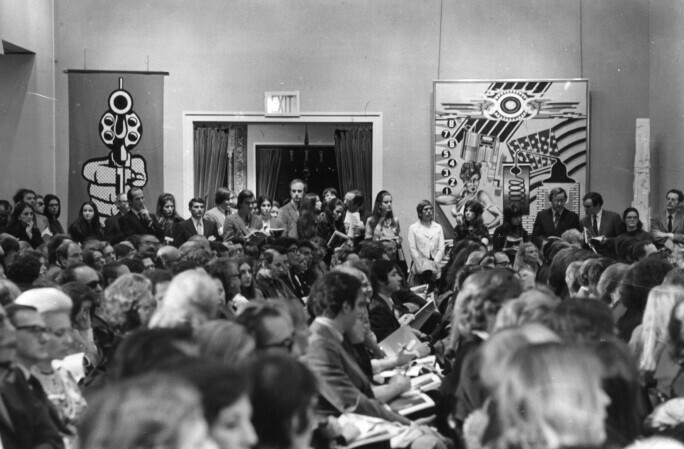 Potential bidders at a Parke-Bernet auction, November 1970. Photo by Fred W. McDarrah/Getty Images. The purchase of Parke-Bernet four years’ later provided Sotheby’s with its first overseas saleroom. Its premises were at 980 Madison Avenue, where a 14-foot aluminium figure of Venus over its front door riled city hall. The goddess’s bosom extended 18 inches beyond the building code’s limit. An annual rent of $25 for the air space had to be paid. One of Sotheby’s early successes in New York was the 1967 sale of treasure salvaged from the wreck of a Spanish ship which sank off the Florida coast in 1715. Sotheby’s mounted an exuberant exhibition and auction. “There was even a live macaw in a reconstruction of the captain’s cabin,” recalls Hugh Hildersley, who had moved from the London office to assist Pollen. For one of the sale sessions – in the spirit of a treasure hunt – only children could bid. The auctioneer addressed every boy and girl as “Sir” or “Madam”. Buying Parke-Bernet began a period of expansion. In the late-1960s and early-1970s, Sotheby’s opened offices in Paris, Florence, Zurich, Johannesburg, Munich and Vienna. 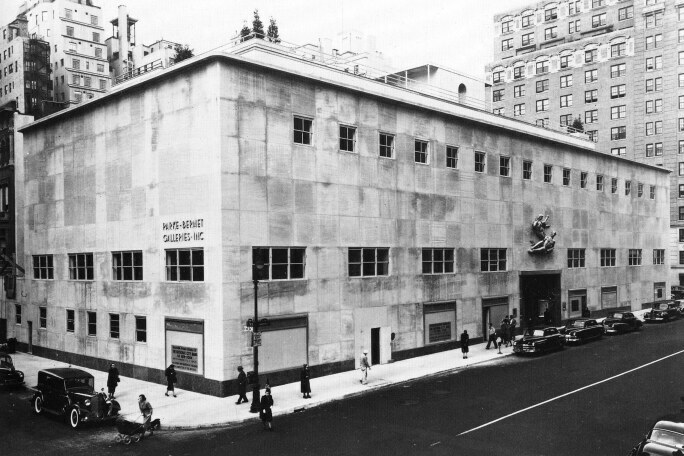 And, in 1980, Sotheby’s New York moved to its present home at 1334 York Avenue. The building had previously been a cigar factory and a Kodak warehouse. 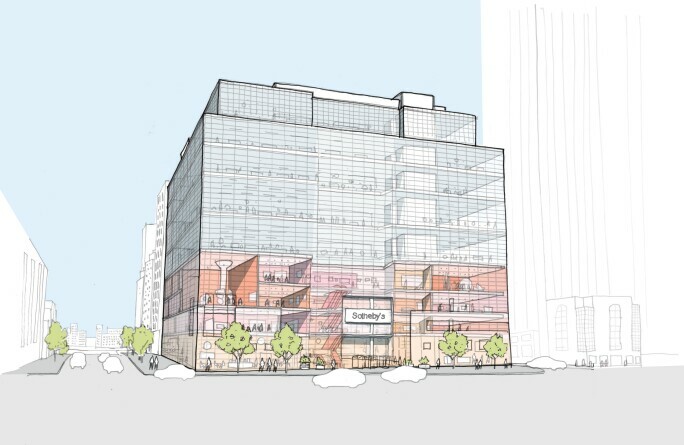 Exterior sketch of Sotheby’s New York Headquarters. Sotheby’s unveil a dramatic expansion and reimagining of its New York City galleries on 3 May 2019. Photo: OMA New York. On 3 May 2019 Sotheby’s will unveil a dramatic expansion of the flagship site, a re-imagining that will create 40 galleries across more than 90,000 square feet. It is a fitting postscript – some half a century on – to that landmark move in 1964.